DevBlog #4 - Space Haven starting to take shape. Bugbyte Forums Space Haven Forums Space Haven Gamedev blog DevBlog #4 - Space Haven starting to take shape. Warning! This post may take some time to load, due to 3 Very cool gfycats showing game play. Please don't pay attention to the messy User Interface It is to be expected of a game so early in development. We have stumbled upon some challenges, but nothing too major. It is always a bit daunting jumping into something completely new as a game developer. Our decision to create an isometric building/survival game did mean we had to move on from the known top-down graphics, and into the world of isometric graphics! Everything is going quite well though, the team is talented and hard-working. I have no doubt in my mind that the end result will be stunning visually, with a certain charm only a Bugbyte game can achieve! We have some cool new features to show you. Above is the scanning of asteroid fields. You can scan and find out what kind of resources are hidden in the depths of the asteroids. 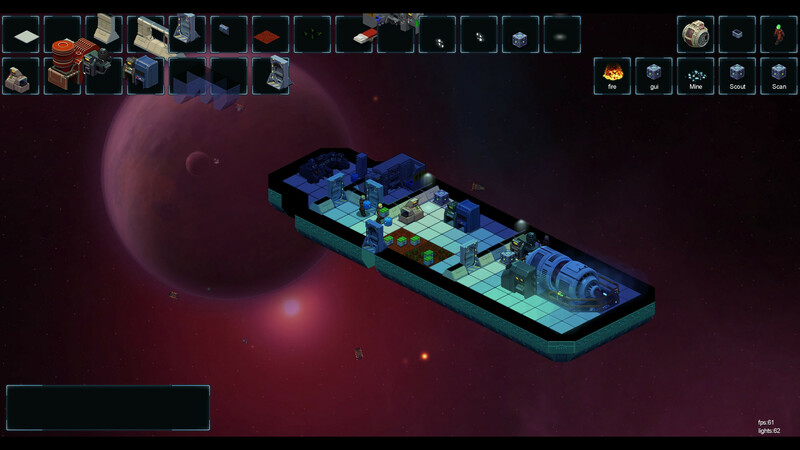 You can then mine them and bring them to a built facility on the ship, to turn the resources into something usable. Something we are really enthusiastic about. 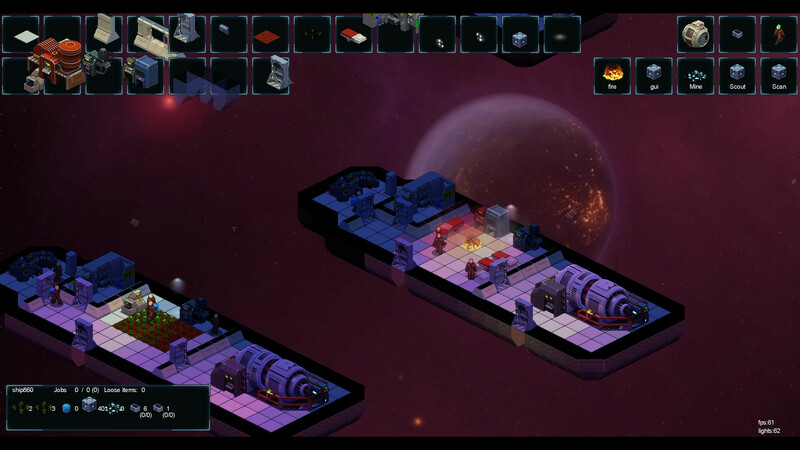 A tile based Space Ship environment simulator, simulating oxygen, smoke, heat and more. We have created a system that moves gas in spaces, making it possible to manipulate for example smoke by building fans to blow in a certain direction. Building certain facilities, like a smelter, will cause a lot of heat to generate. This means you have to get rid of it somehow. Our goal is to have some realistic challenges from building a functional colony on a space ship. Not too realistic, just enough to make the game more interesting and create some challenges regarding building. Hope you are liking these updates. Please understand that these are screenshots and videos from very early development, it is something we wanted to do for our community. So if something looks undone or messy or empty, rest assured that we will bring this game to perfection step by step. Have some comments or questions? Let me know here below in comments, Ill be happy to answer! Will this be available on phones? Sorry if this question has already been asked btw. We will try to include as many devices as we can, without hurting the game play. We will try, but we will announce the supported devices at a later stage. Once we know things more for certain. Will this be available on phones? Because in really looking forward to this game. (09-27-2016, 02:59 PM)Silent Ninja Wrote: Will this be available on phones? Because in really looking forward to this game. Well the game is probaply going to be out on mobile (IOS/Android) the experience is most certainly going to be better on a tablet since you have more screenspace to do stuff on, meaning easier base building. BUT if they have the awesome classical zoom function and adjustable UI, the game will be easier to play on phones. The compatibility list is unknown and what i'm saying might be all wrong as nothing is confirmed as of yet, the videos look like they are from a pc game, but that might just be because its developed on a pc or its a program on a pc to create the game environment and test stuff. If this was helpful, plz tell me, i need some feedback after i write something this long. Yeah looks very nice!I can't await this game to come into the playstores! Yeah Joppiseni you are on the right tracks. It's all about the game play in the end and how we get the user interface to work with it. The game has zoom And we will do our best to support as many devices as possible.